Roping Down; Fixing with Ropes etc. 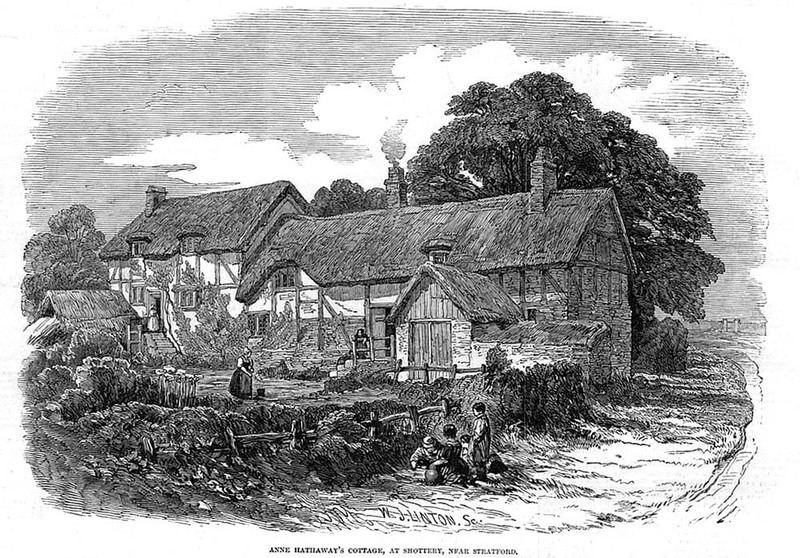 Thatching in Angl., Caerns., Merion. & Montg. 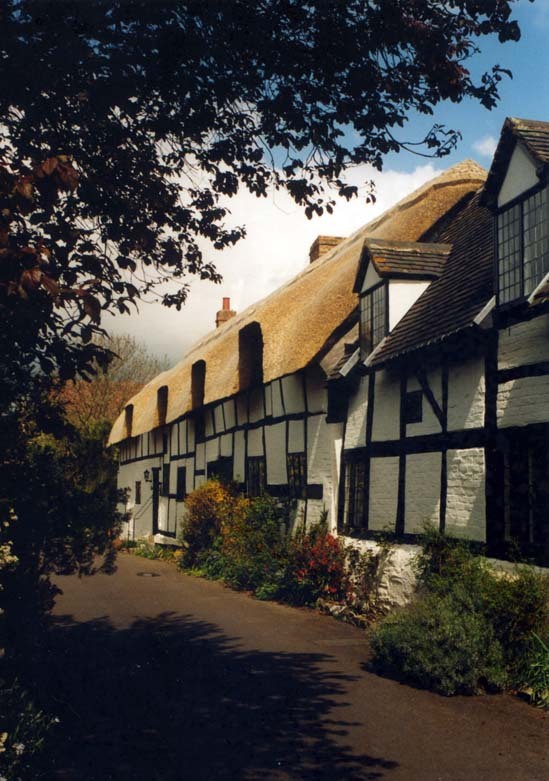 Thatching in North & East Ridings of Yorks. Thatching in Derby Notts W. Riding of Yorks. 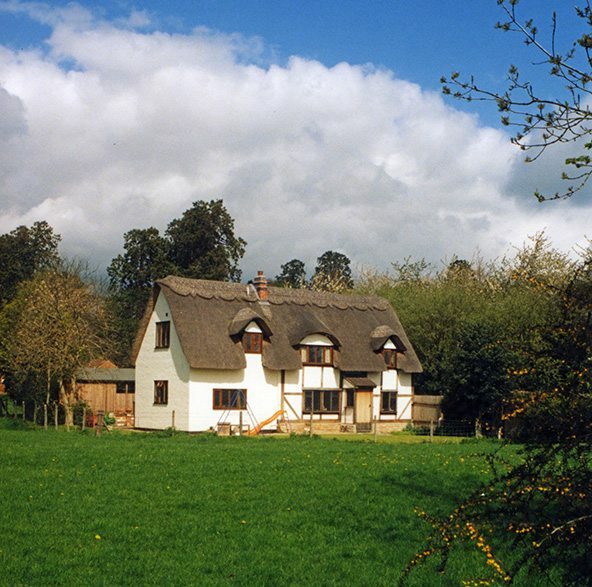 Thatching in Hunts. & Cambs. 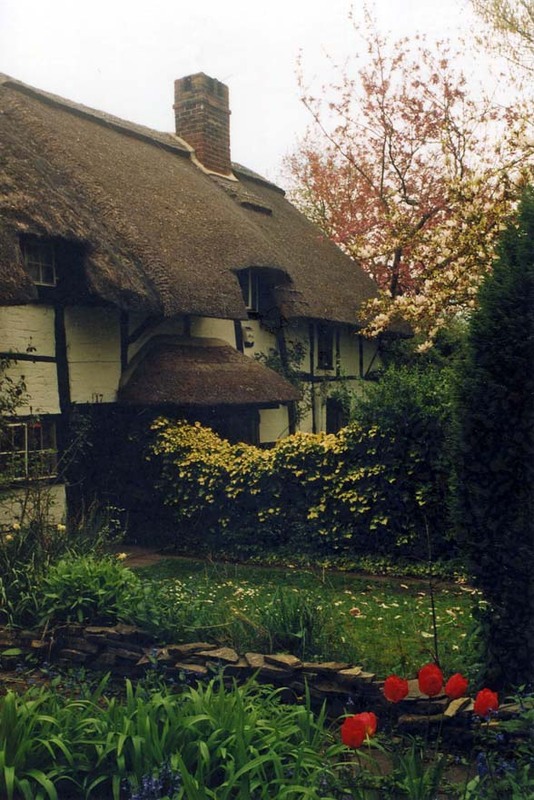 Thatching in Beds. 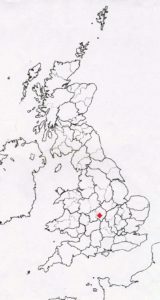 & Herts. 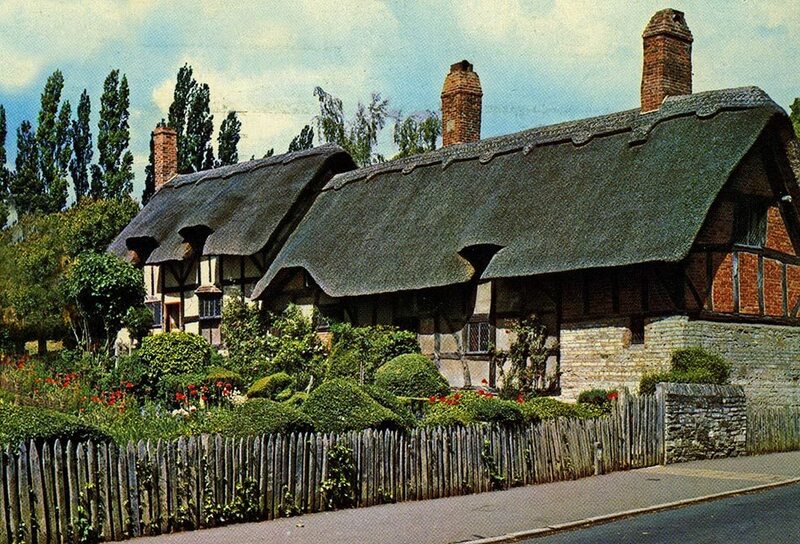 Thatching in Northants. & Bucks. Thatching in Pembs., Cards. & Carms. An early view… Perhaps the earliest. 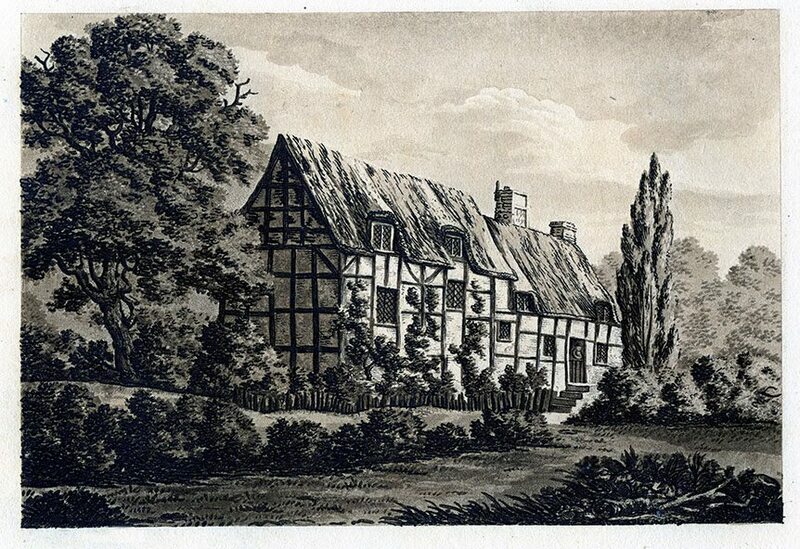 Dating from 1795, this print appeared in ‘Picturesque Views on the Upper or Warwickshire Avon’. The artist has captured a rather plain thatch. Which would have consisted of long straw. The type of work used on this building since it’s construction. 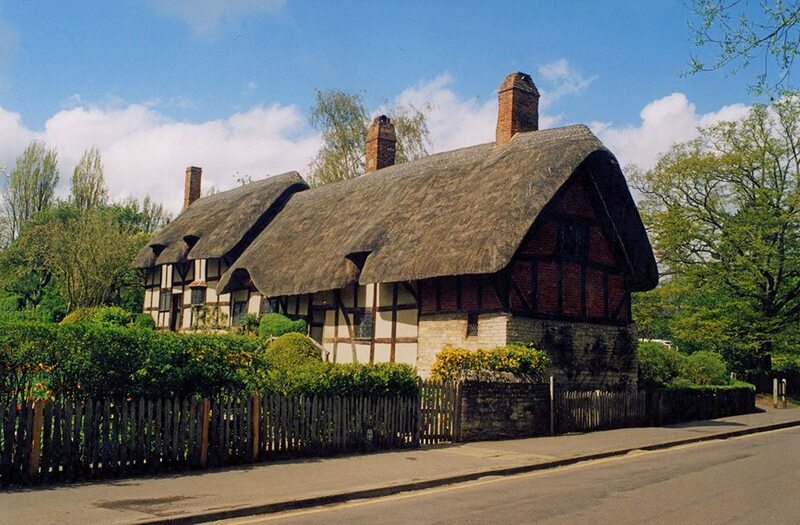 Anne Hathaway was born at Shottery, near the Warwickshire town of Stratford on Avon, in the 1550’s. 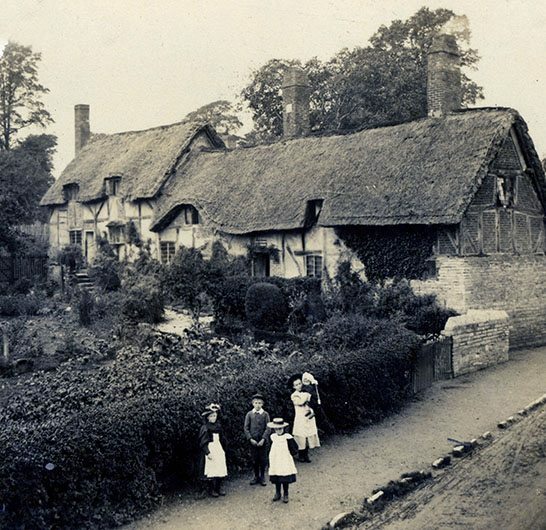 Like many other towns, the risk of fire forced the local worthies to ban thatched roofs, around the time Anne was born. And you’ll find no thatch in the town centre. Fortunately Anne’s home then lay just outside the Mayor’s jurisdiction. 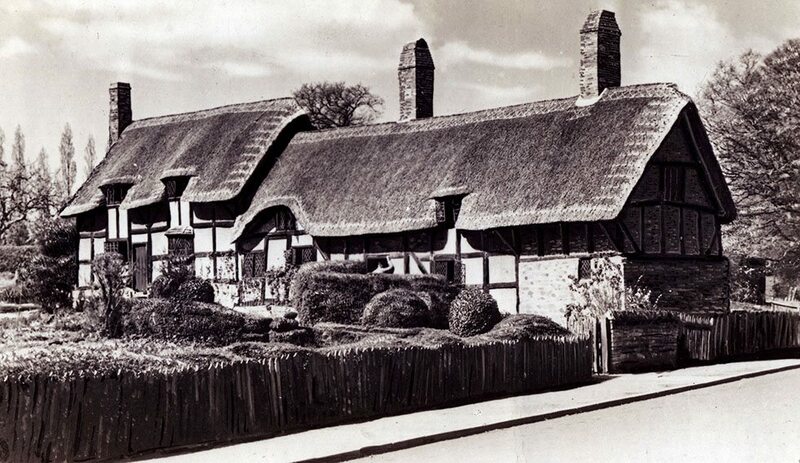 And her hamlet of Shottery, still has some rather fine thatched buildings. 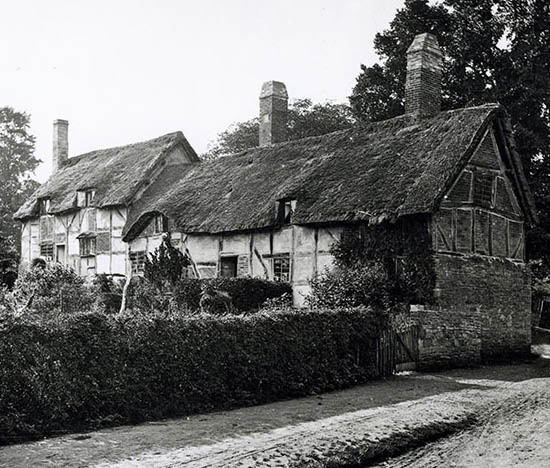 The house young Will Shakespeare would have known; and the one his future wife grew up in, is now the lower portion of the extant building. This is cruck built and has been dated to around 1460. 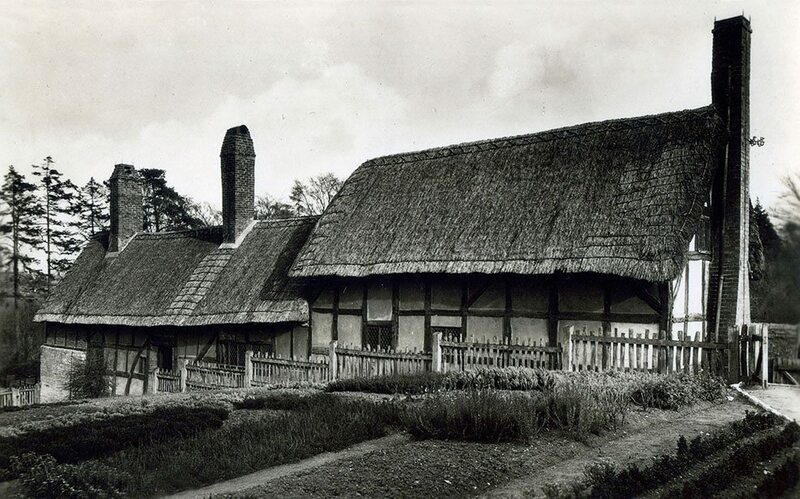 The period when Anne’s ancestors moved in. Remarkably, Hathaway family members stayed here until 1892; when the Shakespeare Birthplace Trust took over. (Britain’s oldest conservation charity.) The higher section of the building, dates from the early 1600‘s. 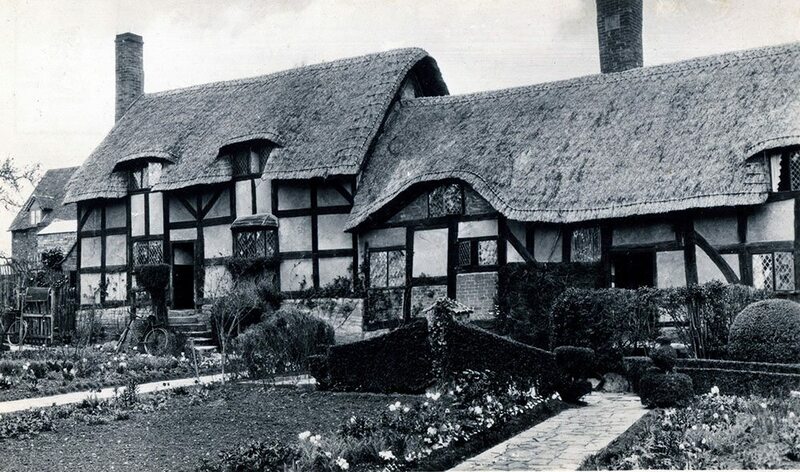 Perhaps being built in Shakespeare’s later days. This building was never a mere cottage; but a working farmhouse, for generations of the Hathaway family. Known in Shakespeare’s time as Newland’s Farm. With a goodly 90 acres (36h) of land. As they prospered, so the size of the Hathaway home increased. To the twelve roomed building we see today. 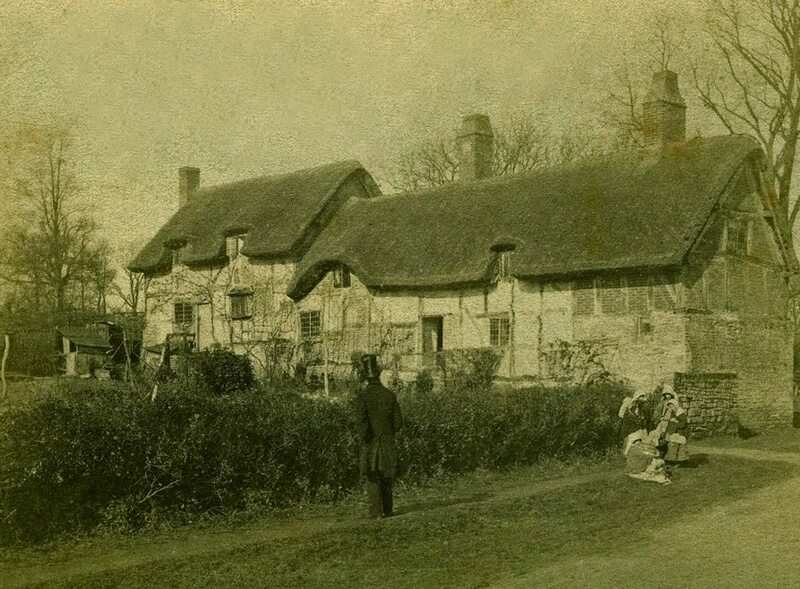 1860’s… The image above is rare, as it is dated… ‘Stratford on Avon. Dec;19th 1868’. It shows the same thatching as the photo on the right. This was produced by John Burton & Sons, a Midlands firm of photographers. They were given the sole rights, to record the events celebrating the Bard’s 300th birthday, in 1864. 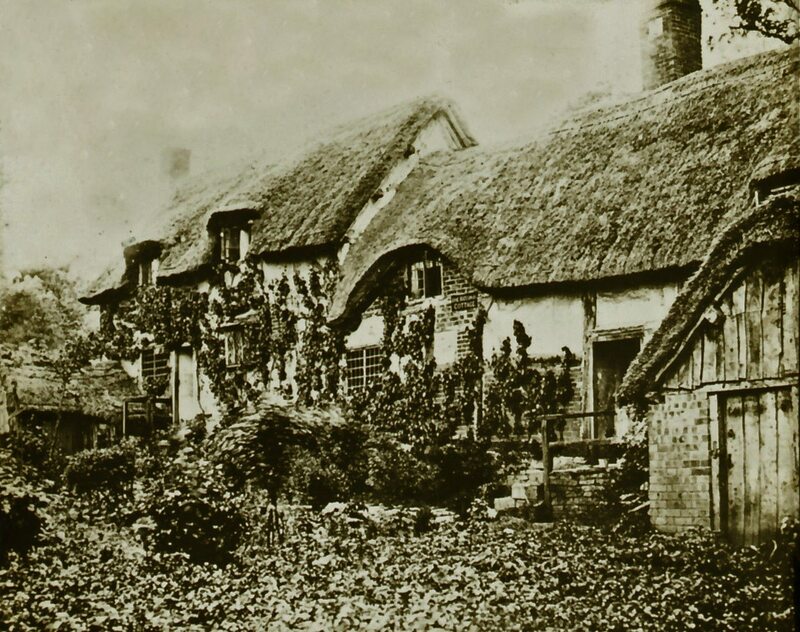 Both photos show a newish thatch, in long straw. 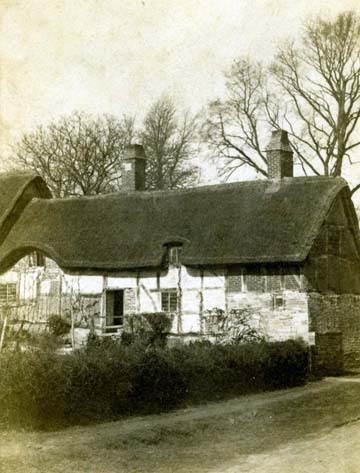 And the thatched porch, shown in the previous drawing, has gone. 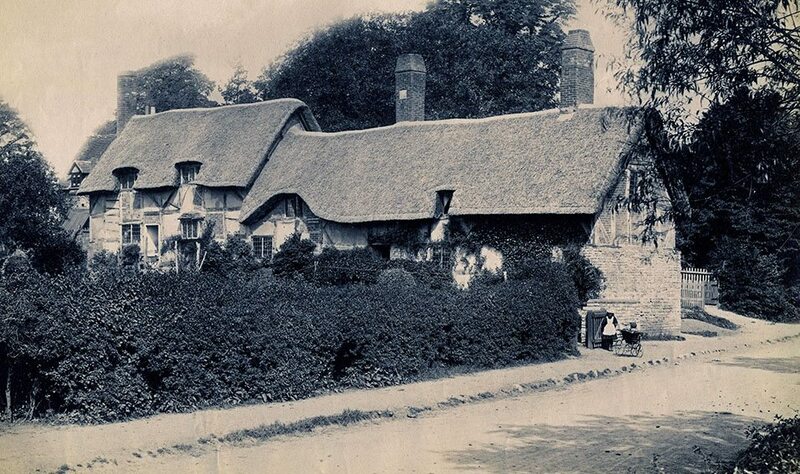 Front and back… Moving on thirty years or so; these two photographs show a neat thatch, in long straw, in around 1930. The mortar ridge is gone, now a fashionable ‘saw tooth’ ridge, protects the top of the roof. On the front at least… The rarely seen rear elevation is somewhat plainer, with repairwork under the large central chimney.